SENTRY #3 I have loved Jae Lee's art since he drew 'Savage' Namor, and picking up this issue only reminds me why. His haunting art style leaves behind the '3 minute abs' nature of super-hero comics, to perfectly suit one forgotten hero's return to the Marvel Universe. Forgotten by all, but The Hulk. HOURMAN #1 Don't spend a second trying to find something to complain about here. 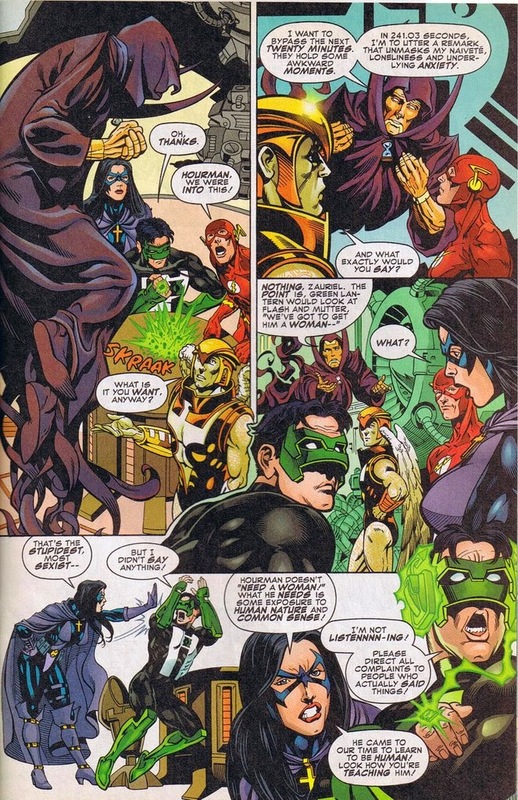 While the JLA taunted on the cover takes the shape of Flash, Green Lantern, Zauriel and Huntress on the interior, the whole issue sings due to two points; writer Tom Peyer's sense of humour; and the way his creativity plays with the concept of a guy who can play Whack-A-Mole with time - popping up anywhere within it. Taking over a Grant Morrison idea and treading down a whacky road can be dangerous grounds for imitation, but Peyer keeps his distance through the re-introduction of Snapper Carr as the futuristic android's modern day tour guide, and depowering the mechanised installment of the Hourman legacy, way beneath what Grant had previously established. I liked the visual aspect of the android Hourman more than the execution I guess. Not that Tom Peyer and rags Morales didn't work their magic on this series, just didn't do anything for me, except him giving his "life" so that the GA Hourman could return. PLus we got the return of Rick Tyler as well. Wolverine#127: I kinda' liked what he did, fooling the Hand and Hydra. Does it require a good bit of belief suspension? Oh yeah, but it's comics mate. Sometimes they just don't make sense. I totally agree w/you on the Jae Lee's art, That creepy, dark art, really suited that series well.